There is currently just the 1 ferry route running between Elba and Corsica operated by 1 ferry company – Corsica Sardinia Ferries. The Portoferraio to Bastia ferry crossing operates weekly with a scheduled sailing duration from about 1 hour 30 minutes. Whilst we’ve taken great care to ensure the information on this page is correct, as the frequency and duration of crossings on all routes can vary from time to time we’d advise that you get a live quote for current availability on this Elba Corsica crossing between Portoferraio and Bastia. 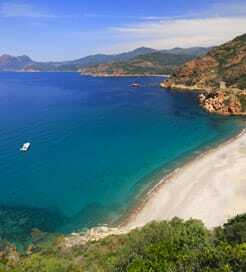 Elba is the largest island of the Tuscan Archipelago, situated 10 km from the Italian northwest coast. 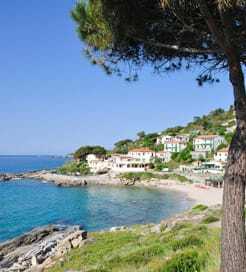 Known for being the location of Napoleon’s exile in 1814, Elba is also famous for its astounding natural beauty, namely its clear blue waters, rugged coastline and pristine beaches. It also boasts a multi-coloured underwater landscape comprising coral reefs, blue fish, lobsters, starfish and even a sunken ship, making it a haven for divers and snorkelers. After a day by the seaside, be sure to make your way over to one of the fascinating museums showcasing a range of archaeological findings, or to Napoleon’s stunning Villa dei Mulini for an insight into the island’s rich history. As the most visited and popular island in the Tuscan Archipelago, Elba has an extensive ferry network with multiple ports providing crossings to the surrounding islands and the Italian mainland, all operated by a range of leading ferry companies.